Charles Grant next volume is now available from Cavalier Books. My copy arrived in the post yesterday , I have not had a look at it yet as Mrs W.O.T. has put it away for Christmas . Still something to read on Christmas day . 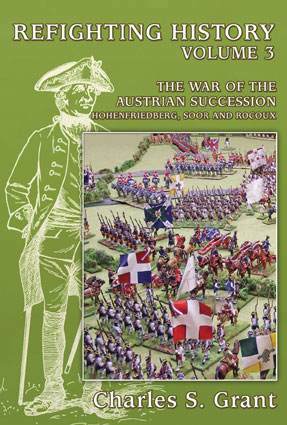 volume Three of Refighting History follows on from Volume Two continuing to examine and refight the battles of the War of the Austrian Succession. There are two more of Frederick's big battles. These are Hohenfriedberg and Soor, each divided into two games. There is in addition a rather unusual game featuring the attack on Frederick's camp by Nádasdy and Trenck during the battle of Soor.